28S-DMH-118 is a ‘28S’ 4Ground model kit, ‘28S’ means this kit is highly detailed inside and outside with many pre-painted parts. This kit includes pre-painted parts with high levels of internal and external detailing, also included are optional coloured paper posters and three options for the two coloured ‘Sassy Gal’ signs for both head boards of the Saloon. Most walls, external and internal, in 4Ground kits, are double skinned for strength and to enable detailing inside and out of the model. Each storey can be removed for easy in-game access, all windows have printed acetate for glazing and all doors are working. On the ground floor of this saloon hotel there is a bar, an office, a raised stage, a saloon hall area and two flights of stairs leading up another two storeys to the eleven guest rooms. Both upper storeys can access the balconies which front the building on two sides. Stuart was an orphan child, originally of Manchester, England. In his early teens as a member of a ‘gutter snipes’ gang called ‘The Wheatley Boys’ he murdered for the first time. Wanted for murder, he had to quit the ‘cellar dwelling’ he shared with eleven others including his beloved sister ‘Elli’. Stuart made for the army intending to ‘go straight’. Private, Stuart L. E. Wheatley served well for five years making Lance Corporal, but after ‘Inkerman’ he had finally learned dead fools go straight, survivors duck and dive. Wheatley deserted, once back in ‘Old Blighty’ he was soon off again, this time for America via Liverpool for New York. After a few years in New York Wheatley headed out west, he came to Dead Man’s Hand when it was still a small camp. As this camp became a camp-town Wheatley’s influence grew; within a year the first of his ‘joints’ had burned down and new timbers were already in place for his second much larger venture, ‘The Sassy Gal Saloon’. Through his old New York contacts he advertised hotel jobs to girls back east, purchasing one way tickets for these hapless souls who would find themselves stranded with no choice other than to become ‘soiled doves’ and ‘work the rooms’ for the cold hearted Wheatley. 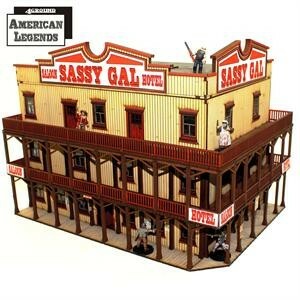 The ‘Sassy’ with its raised stage in the saloon, quickly became known for its varied entertainment, from dancing gals and scantily clad song bird singers to boxing fights and freak shows. Above the heads of customers in the saloon area a ‘Celestial’ Chinese gal would often tight rope walk along its length. Stuart L. E. Wheatley has made it up the hard way to build his boardwalk empire, when it comes to competition Wheatley has remembered every lesson of his past. He has been as ruthless as he was cunning and even thought by many to be the paymaster of the road agents that prey on weak travellers on the roads out of town. Rumours persist he is also responsible for disappearances and so many of the unfortunate, possibly not so, accidental recent deaths. Almost an instinctive winner he has had to tighten his grip of late, but maybe he has now met his match with the advent of ‘Slick’ Dan Pottinger’s gambling parlor ‘The Blue Canary’. It doesn’t help that the tiresome daughter of dead Jim Rogan, ‘Kat’ is still doing well with her ‘Rogan’s Bar’!